Judge Eugene Blake awarded Congo points at the Ventura shows in California. Congo was awarded Best of Breed at the New Mexico shows. Congo finished his AKC Championship by taking Winners Dog from the Bred By class at the Trinity Valley/World Congress Specialty. Handled to his championship by Phyl and Ryan, Ryan handled him at the specialty under Judge Tony Lord Edwards of Ireland. He was invited to the 2005 AKC/Eukanuba National Invitational and traveled to Tampa to compete in that show. He is now enjoying retirement and travels with his owner, George, on medical missions. The picture on the left was taken ringside at the Trinity Valley/World Congress Specialty held in Dallas, Texas. Hanging out ringside, Congo (as usual) wanted to be up in someone's lap. So, he was making overtures to Ryan about being held. When she started hugging him, he looked away, then reached over to give her a little love kiss on her nose. When she kissed him back, he showed a bit of disgust (it was in public after all) and then decided that it wasn't so bad afterall even though people were watching. 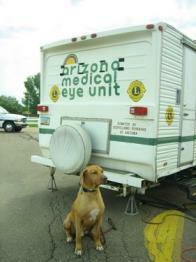 Congo hangs out at the medical eye unit trailer on one of the medical missions George went to in Northern Arizona. Congo and Lexi, the Whippet, enjoy taking walks around the neighborhood.